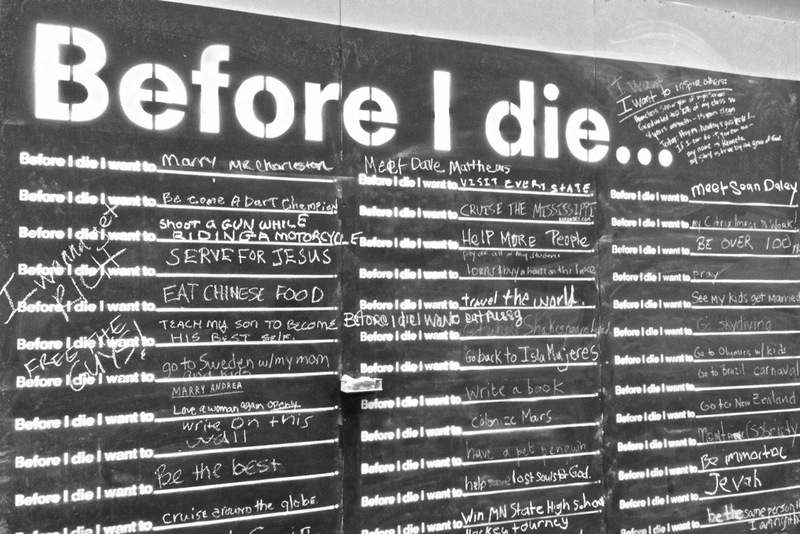 The Before I Die project has come to the skyway system in downtown Saint Paul. It’s interesting to read what individual’s hopes and dreams are before they leave this earth. I felt a little guilty reading some of the wishes on the wall because the dream of seeing Ireland or getting married or sailing on a cruise ship are all things I’ve already done. Yet for others they are big bucket list items. So I ask on this day 197 of Photo 365, what do YOU want to do before you die? This entry was posted in Photography and tagged Before I Die, Photo 365, Saint Paul. Bookmark the permalink. Take my kids to Hawaii. I was there four times before they were born and I want them to experience it as well. Mahalo for sharing this photo! What do YOU want to do before you die? What a great idea – sharing something you love so much with the ones you love more than anything! My list is so long … I think living in a foreign country would top my list though!